That's so fast, at this rate looks like Nintendo will push at least 4-5 smartphone games a year. 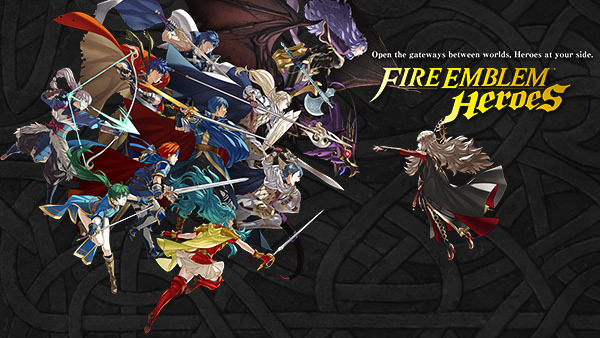 Nintendo’s hit strategy-RPG Fire Emblem series is now re-imagined for smart devices. Fight battles customized for touch screens and on-the-go gameplay. Summon characters from across the Fire Emblem universe. Develop your Heroes’ skills, and take them to new heights. This is your adventure—a Fire Emblem that’s like nothing you’ve seen before! Take part in strategic turn-based battles streamlined for on-the-go play with maps that fit in the palm of your hand! You’ll need to think hard about the advantages and disadvantages of each Hero’s weapon—and even evaluate the map itself as you battle. Lead your army with easy touch and drag controls, including the ability to attack by simply swiping an ally over an enemy. Story Maps: The story brings together new Hero characters along with familiar faces from the Fire Emblem series. Lead your army to victory to save the Kingdom of Askr. Training Tower: Engage in battle scenarios of varying difficulty that you can play over and over to earn rewards and experience (EXP) for your allies. Each time you take on these maps, the enemies and terrain change to offer a new challenge. Arena Duels: Fight against your rivals around the world. Your high score and ranking will determine your rewards—items that can increase your Heroes’ abilities. Hero Battles: Under Special Maps, discover various battle scenarios that are available for a limited time. Defeat the Heroes who oppose you to convince them to join you as an ally. The long-running hit Fire Emblem series comprises strategy / role-playing games with deep tactical elements and depth that increases with every move you make. As you progress through the story, you will meet and bid farewell to many allies. playing it right now, enjoying it. I'm enjoying fire emblem heros, its actually the very first fire emblem game ive played and it makes me want to go and check out the other titles on Nintendo 3DS. if you guys want to add me ill post my ID code later. Health, Lifestyle, Animals, Plants, Resurgelife. Sorry Jack, but i don't believe you are capable of feeling anything. Btw, is it me or are these bots Nintendo fans? They always seem to have good things to say about Nintendo and nothing about the others. I don't know about that. Lately xbox fans are on the same level. What do you mean lately? To be honest i felt burned by MS at the end of the 360 wich was their highest point. Thats when they started dialing down on exclusives. Last edited by Nem; 11-28-2017 at 11:03 AM. To be honest u felt burned by MS at the end of the 360 wich was their highest point. Thats when they started dialing down on exclusives. Why would I feel burned if they delivered what I wanted? I tripled the hours I watch television and sports. Games aren't essential on a video game console. When will people realize that? Btw that was a typo. I meant to type "I" not "u". I do disagree though. Games are very important for games consoles. Otherwise, why would you buy one? Just to watch netflix? You don't need to upgrade your box is that is all you want. Until now you made this correction? I believe it's obvious that I was being sarcastical when mentioning the games issue. The console reveal will live on as one of the things that damaged the future of the xbox one and that fans are refusing to aknowledge that the lack of games (exclusives) isn't helping bringing more people to their side. Yeah, i totally missed your previous reply. I hadn't noticed how old the thread was too. Silly bots!